"What are you training for right now?" is a common question I hear from my friends. "Nothing," I answer. "I'm not training at all." They usually look perplexed. As long as they've known me, I've had some sort of epic event marked in red pen on my calendar, even if it was months away. Right now, smaller goals are only penciled in, lightly, and in the meantime I don't have any tangible motivation to ride my bike. So I just ride my bike. On Friday, I followed a sucker hole to the Valley, giggling out loud when I first glimpsed my shadow amid the swirling clouds. Tourist traffic was light that day, and the Steep Creek trailhead was closed due to bear activity, so I had the rare privilege of having the Dredge Lake Trails all to myself. I laughed and sang along with my iPod and looped the moss-covered corridors as filtered sunlight flickered through the trees. Two hours passed in what seemed like a dozen rapid heartbeats. I returned home soaked in rainforest bliss. Recently, my friend Dan, whose sole bike is a Surly Cross Check equipped with ~38c tires, drop handlebars and a homemade rack that could support a small deer carcass, asked me what "mountain biking" was like around town. "Let's go riding on Sunday!" I said. 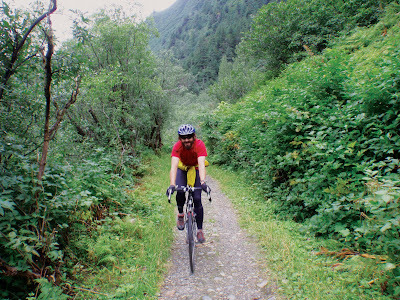 "I bet you could ride your Cross Check on the Perseverance Trail." So we met up in the morning. I had to pump the big ring to keep up with him on the pavement, and still had to leave it there as we shot up the steep trail. Dan followed my line, splashing through streams and weaving around wet boulders. By the time we reached the top of the canyon, we had already decided we were going to tack 22 more miles and 1,500 feet of climbing onto our ride with a dash up to Eaglecrest Ski Area, so I was surprised when he suggested we take the Red Mill spur down. "I don't know. It's pretty technical. Not to mention choked with brush. We'll be soaked." But Dan has this summer goal - which is right up my alley, actually - of running or hiking every trail in town. The fact that he was on a bike did not seem to be a hindrance to this goal. He wanted to check off the Red Mill trail. So we veered up the loose gravel and began our traverse of the steep sideslope. The narrow slash of a trail was littered with slippery wet rocks and roots. We both did our fair share of wavering and kicking off trees and the hillside. But when the downhill began in earnest, Dan locked in. He leaned way back, hovering over his narrow rear tire as we tackled a succession of dropoffs, our bikes harmonized in a chorus of clunking down the rocky pitch. I was nervous but determined; if Dan could ride a freakin' rigid cross bike down this trail, I told myself, then I could handle it. Clunk, squeal, clunk, clunk. A whitewater creek rushing beside us drowned out all other sounds. 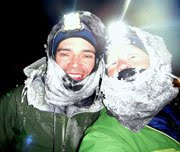 We skidded to a stop at the Perseverance Trail intersection, massive smiles spread across both our faces, and commenced the screaming descent in a blur of wind-induced tears and white noise. Life's good when you have no agenda. Hi Jill . 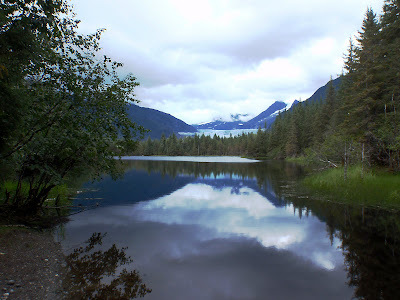 . . As a former Juneauite, I really enjoy your photographs and writings, and nominated your blog for the Kreativ Blogger Award on http://mariesansone.blogspot.com. That was a great blog entry. Captures the essence of what riding is all about! Thanks! Way cool....woulda liked to see a video of the descent. We saw you and Dan out North Douglas on what must have been your way back from the ride up Eaglecrest yesterday (ran up and then picked gluttonous amounts of perfect blueberries!). OK...I'm going to steal your 'no agenda' for myself for the fall! 'Training' will be swapped for 'playing'...I'll keep you posted! PS...we made it home in one piece...and thought of you lots while we drove through all the waypoints of your GD trip! 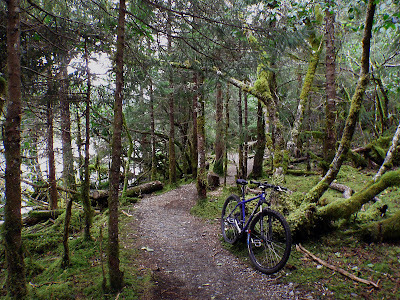 That first shot is so incredibly beautiful, the scenery around Juneau is amazing. So nice to read about you having FUN!!! Aha. You have discovered the skinny side.